Director – Peter Ramsey, Screenplay – David Lindsay-Abaire, Based on the Book The Guardians of Childhood by William Joyce and the Short Film The Man in the Moon Directed by William Joyce, Producers – Nancy Bernstein & Christina Steinberg, Music – Alexandre Desplat, Visual Effects Supervisor – David Prescott, Animation Supervisors – Anton Gray, Steven ‘Shaggy’ Hornby, Philippe Le Brun, Dave Pate & Pierre Perifel, Production Design – Patrick Marc Hanenberger. Production Company – DreamWorks Animation SKG. Three hundred year ago, Jack Frost was created by the Man in the Moon. Having been given the ability to create frost and ice, Jack enjoys inspiring kids to snowball fights but over the years has felt ignored and overlooked because he is invisible to ordinary humans. North, or Santa Claus, now has a premonition of a dark shadow covering the world. He calls all the other Guardian spirits – the Easter Bunny, the Tooth Fairy and The Sandman – to him to see what can be done about the crisis. They ask the help of The Man in the Moon who indicates that the one who will save them will be Jack, even though the others regard Jack as an ineffectual Guardian. Jack is summoned and cautiously joins the fight. They soon find that the menace they face is Pitch, the former boogeyman, who has found a way to turn The Sandman’s dreams into nightmares. Pitch has now started capturing the tiny baby tooth fairies. In waking up to find no teeth under their pillows, children’s belief in The Guardians is starting to erode. As the powers of the other Guardians start to fade, Jack becomes an unlikely hero, but also one that Pitch seeks to woo over to his side by appealing to his feelings of being ignored. Rise of the Guardians was the 22nd animated film from DreamWorks Animation SKG, joining the likes of like Antz (1998), The Prince of Egypt (1998), The Road to El Dorado (2000), Shrek (2001), Spirit: Stallion of the Cimarron (2002), Sinbad: Legend of the Seven Seas (2003), Shark Tale (2004), Madagascar (2005), Over the Hedge (2006), Bee Movie (2007), Kung Fu Panda (2008), Monsters vs Aliens (2009), How to Train Your Dragon (2010), Megamind (2010), The Croods (2013), Turbo (2013), Mr. Peabody & Sherman (2014), Home (2015), Trolls (2016), The Boss Baby (2017) and Captain Underpants: The First Epic Movie (2017), as well as various sequels to various of these. 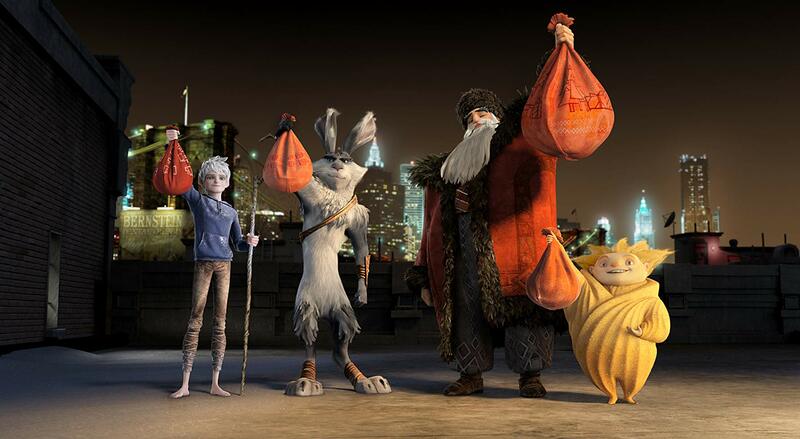 Rise of the Guardians is based on a series of books by William Joyce, a popular children’s book illustrator and author. Just as much as he has worked in books and magazine covers, Joyce has a dual career in film. He did concept artwork on early Pixar films like Toy Story (1995) and A Bug’s Life (1998), graduating to production designer and producer of Blue Sky’s Robots (2005) and to an animator for the opening credits of Mr Magorium’s Wonder Emporium (2007). There have been several works adapted from his children’s stories with the animated tv series Rolie Polie Olie (1998-2006) and George Shrinks (2000-1) and most famously the Disney animated film Meet the Robinsons (2007), which he also wrote, and Blue Sky’s subsequent Epic (2013). Rise of the Guardians began in 2005 as The Guardians of Childhood, an original screen treatment that Joyce developed with his company Aimesworth Amusements, which was to be directed by Joyce. Out of this, Joyce produced a short film The Man in the Moon but could not get a full film launched. When this stalled, Joyce developed the Guardians of Childhood idea out as a series of children’s books with The Man in the Moon (2011), Nicholas St. North and the Battle of the Nightmare King (2011), E. Aster Bunnymund and the Warrior Eggs at the Earth’s Core! (2012), Toothiana: Queen of the Tooth Fairy Armies (2012) and subsequent to the film The Sandman and the War of Dreams (2013) and Jack Frost: The End Becomes the Beginning (2018). The rights to these were then picked up by DreamWorks. Joyce originally signed on as co-director but dropped out in 2010 after the death of his daughter. Rise of the Guardians goes ahead with a script by playwright David Lindsay-Abaire who also wrote Robots, Inkheart (2008), Oz: The Great and Powerful (2013) and Poltergeist (2015), and is known for stage work like Rabbit Hole (2006), which was later adapted into a film, High Fidelity (2006) and Shrek the Musical (2009). The director is newcomer Peter Ramsey, previously a storyboard illustrator and second-unit director on various films who made his directorial debut with the 30-minute tv special Monsters vs Aliens: Mutant Pumpkins from Outer Space (2009). Ramsey marks the first African-American to take up the director’s chair of an animated feature film. Subsequent to this, Ramsey co-directed the hit of Spider-Man: Into the Spider-Verse (2018). As with several previous DreamWorks animated films, Megamind, Kung Fu Panda 2 (2011) and Puss in Boots (2011), fantasy film director Guillermo del Toro has signed on as executive producer. Rise of the Guardians in effect acts as a children’s movie version of The League of Extraordinary Gentlemen (2003) or The Avengers (2012). The story has been based around the premise of having various popular imaginary characters – Santa Claus, an Australian-accented action movie version of the Easter Bunny, the Tooth Fairy, The Sandman and Jack Frost – team up to deal with a super-villain. There is a very mild amusement to this on a conceptual level but mostly Rise of the Guardians feels stretched in terms of possibilities – I mean, how much can you make out of the concept of Santa Claus, The Easter Bunny and Jack Frost (who is little more than a teenager with pale skin and a wand that creates frost everywhere he goes) as superheroes? Mindedly, the conflict sort of played out in the earlier The Santa Clause 3: The Escape Clause (2006), although there Jack Frost was the villain who was trying to usurp Santa Claus. I just couldn’t get into Rise of the Guardians. Maybe I switched off at the constant sequences pitched to the 3D audiences – snowball fights, characters constantly engaged in helter skelter races skidding through the streets, skies or down into the depths. These seem there solely to add a kinesis to the film at certain intervals while serving next to no dramatic purpose. The film tosses up large scale fight scenes and a big climactic showdown with the creatures and kids fighting against Pitch but these are pretty eye candy that seems to wash over you and are forgotten the moment the sequence does. The film engenders a mild degree of wonderment – Jack making a bunny out of frost, Sophie – a character that seems overly borrowed from Monsters, Inc. (2001) – making Easter eggs, the climactic turning of the night mares to dream dust. However, you are never less than aware that the film is pushing a button that tells you to go “awwww” at that point. Everything is played exactly to a modern animated children’s movie formula and there is nothing that stands out beyond that. 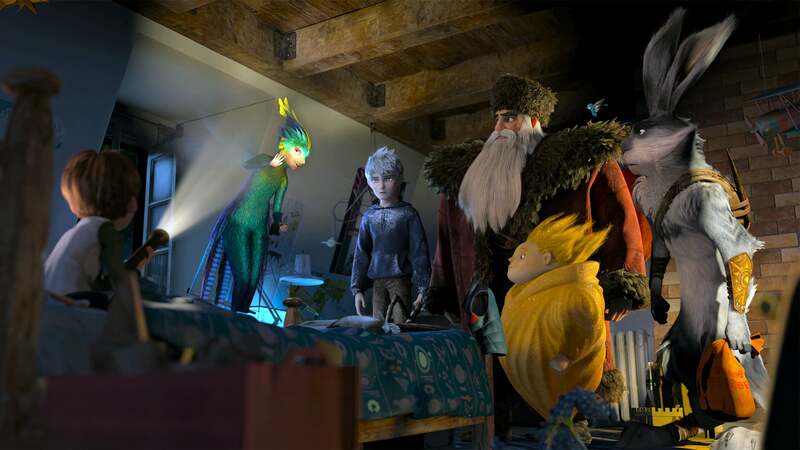 Indeed, coming out of Rise of the Guardians, I remember a film that engaged my brain on a minimal level – about the same level that tuning out and letting tv play in the background does – but failed to provide anything distinctive or standout in the way of animation, humour, creativity or cleverness during its 97 minutes.